A roguelite in an alternative Victorian history, oh my! The list of intriguing upcoming Switch eShop releases continues to grow, and now we can add Ironcast to the roster. Published by Ripstone and developed by Dreadbit, it's a 'steampunk mech combat game' with turn-based strategy; it also seems to have some puzzle / matching gameplay. You can get an idea of what it's all about in the trailer and press release excerpt below. Battles are fought by generating resource nodes which in turn drive the Ironcast's various weapons and systems. Players must choose how to spend these nodes wisely; either offensively to cripple and destroy opponents, or defensively, if they suspect a barrage of incoming weapon fire is due. The roguelite style of Ironcast enforces that death is permanent, but rewards are persistent and no two campaigns are the same. With randomly generated missions, over 50 unlockable items and the potential for rare enemy loot drops, commanders will face a new crusade with every play through. It's a game that'll also tap into the various play setups of the Switch, with TV play, handheld and desktop gaming all supported. The Pro Controller will be an option as well as touchscreen alternatives, while HD Rumble is promised. There's also a livestream on right now, which you can see below if you've been quick to read this article. 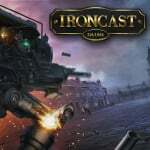 Do you like the look of Ironcast? ... off-topic: I wish someone would reboot "Metal Masters"
On topic: Will wait for NL review. Doesnt look like my cup of tea. I was hoping for something a bit more Mech Warrior. I'm not a fan of the whole perma death thing so I'll be skipping this one. Looks pants, to be frank. Not for me, thanks. Why can't a developer make a proper mech game like mech assault? Is that asking too much in 2017? Watching the livestream, the game is a grower I reckon. Well that went from 100 to 0 real quick for me. Mech combat? Steam punk? Hell yeah! Then I saw the puzzle screen....and just like that my hype faded. Here I was hoping for an actual action oriented mech combat game and this is what we get. Bleh. Pass. @Pink_Floyd the technology was lost in the late 2000s, after the awesome looking Steel Batallion game hit the market with its dozens of controls, the gaming community set fire to all their awesome game plans for mech games. Mecha fans everywhere have been living underground, hoping and praying that a baddonkey mech game would rise from the ashes, alas, there is this game. On a serious note, yes, mech assault is awesome and we need more games like it! I had a good time with this on Steam a while back. It has a decent amount of depth, I think. I'd consider buying again for portability. This is actually an excellent game. I've been playing on PS4 for quite some time. It's basically a match-3-type-meets-rogue-like type of game, and it works really well. The story and presentation are decent, if nothing special. The gameplay though, is actually pretty deep, with interesting combat and some RPG elements. The real hook though, is obviously the rogue-like element, that keeps you coming back for more runs, while you improve by on the hand learning the mechanics better and better and also by buying some upgrades with "commendations" that you can earn, and which carry over between runs. I can highly recommend it to anyone who enjoyed games like FTL, Darkest Dungeon and so on and so forth. Honestly, if it's not price at a Nintendo-Premium, and once I get a Switch, I might actually double dip for that one. well... enough with the indie games!!!! Is there any... i mean ANY 3rd party publisher making something on switch or what? This has been on my Steam wish list for a while so I'll get it on Switch now instead, so long as it's a good port. @Ralek85 Any idea if there's a better description for this than "match-3"? I mean, you connect multiple (identical) tokens, rather than get a line of three tiles to match. This is pretty much match-3. There's nothing "steampunk mech combat" or "cool" about it imo. Not for me, hope it becomes a good addition to the Switch library nonetheless. Starting to loose me a bit but never really given it a shot so I could be persuaded to give it the old college try. Aaaaand thats me gone. There's nothing more disengaging into the strategy and excitement of warfare for me than having to conduct a little colourful brain teaser like if I pulled out a Connect 4 set in the middle of a boxing match. It looks like a free to play mobile phone game. C'mon now...Mech Combat Game my eye. Not an RPG blend, but Puzzle Quest was still a sufficiently awesome game to leave me in the market for more possible match-three crossovers. Especially if the lore and story deliver as much as they seem to promise here. @Pink_Floyd Harebrained Studios is doing a turn-based Battletech game. That is a great skin for an extremely basic game. What a disappointment. lol. hey you two! no punching until you match three of the same color! this looks terrible. someone can download it on iphone while they wait for at rain, then delete it when they get off the train. I was expecting someting awesome like a first person shooter against robots..and is a lame puzzle. If priced really sensibly, may well be worth a look. Hmm, well, considering how harsh early reception has been of the announcement/trailer, I hope Ripstone goes for a reasonable price. I might give it a shot for $4.99. Others might feel the same way if they were to use that strategy. Charge 9.99 or above for a niche title and get a handful of sales, or charge 4.99 and get the impulse buyers as well, for sevenfold that handful. Hope you're reading this, Ripstone! I thought it read Mech! @Pahvi Yes, I guess you could basically connect the whole grid in an ideal situation, as there are "connector" bits as well as skills that replace some bits with others ... but no, I don't know what to call other than "match-3", maybe "match-3-or-more"? Because you still have to match at least 3, that much is unchanged, it's just that you can build chains by matching even more. Somewhat apt in this case. and was interested no more. As skeptical as I was for this turning out to be a match-3-or-more game from the trailer, watching a proper gameplay trailer has put me in the "wait for a review" camp. Quite frankly, this game looks WAY more complex then first impressions due to having to manage 4 independent stats with those blocks. True, I would prefer another Mechwarrior/Mech Assault, but this game looks like it could be quite fun as well; just more for RPG people than FPS/RTS people. It's sad that my reaction went from "Oh this sounds cool!" to "Oh great another mobile puzzle game..."
Cool. Looks sort of like a mech-themed Puzzle Quest. I'm down, if it has that same level of depth to its mechanics. That's a garbage lie of a headline you wrote: this is an phone-tier puzzle game with a mech skin. >Of course there's also Hawken, Heavy Gear Assault and Mechwarrior Online if in-cockpit action is more your thing, or Titanfall 2. Not indie, but c'mon, how could I not mention Titanfall? >Mecha anime fans, and fans of weird stuff in general, got 100ft Robot Golf. The comments expressing disappoint of a mech combat game actually turning out to be a match 3 game is hilarious. That aside, I'll wait 4 reviews and see how it fares. Do not care for the artwork at all. It looks like a European RPG. Mech fighters should be anime styled or not at all. @Captain_Toad Well, it is a mech combat game, except in "match-3" trappings instead of "action" or "turn-based strategy". I am curious to read a review, too — mostly on the control options and how it plays. Not sure how it plays on PS4 and XBoxOne, since those don't have a mouse ei,herm unlike PC. I was excited and then I saw gems. I then checked reviews for this game and they were decent so I might give it a try pending price. I can't see paying more than $5. Maybe they'll release a demo that causes some kind of addiction. Bejeweled With A Story was cute when Puzzle Quest did it. Looked cool but once I saw it was a puzzle game, I backed off. PAD is good enough for me. Oh, its just another Jewels. Pass!